If you are looking for an easy recipe that can be made in 30 minutes and is a sure winner for company meals, then you have come to the right place. Most often my husband does the cooking for our dinner parties and many times his recipes are quite intricate and involved and take a lot of time to execute. Sometimes he starts the process a day or two in advance depending upon the menu for that evening. Some things actually improve and the flavors have a chance to blend and/or mellow by doing this. Soups are a good example. They can be served chilled or reheated, depending upon what is best, and finishing garnishes added at the last moment before serving. It is nice to find an occasional recipe that is not only delicious but also simple and easy to make, and he has amassed some of those as well in his collection of recipes. 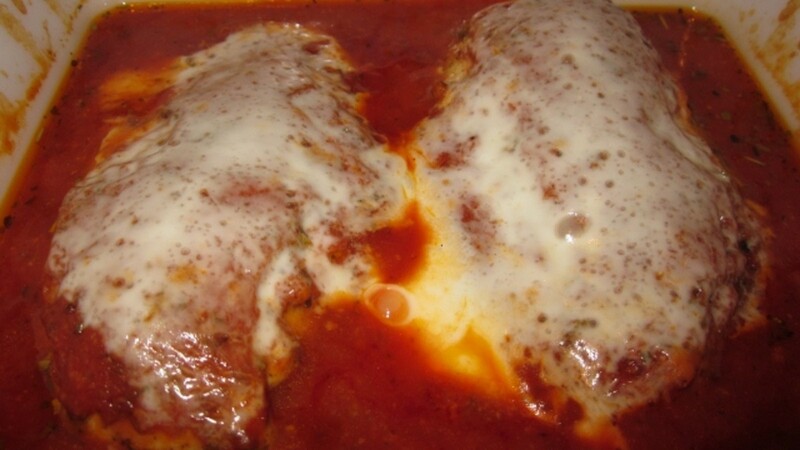 After trying a new recipe and following the directions exactly...my husband then likes to play around with it to see if he can come up with something new or make alterations, and this is how this easy chicken mozzarella recipe with Italian flair was created. It is quite different from the fish entrée which originally inspired it. This is one of the three ingredients aside from salt and pepper seasonings in this recipe. You heard that right! You need only three ingredients to make this delicious dish. This recipe calls for fresh mozzarella cheese and if you can locate it and if your budget allows buffalo mozzarella is the tastiest version. Fresh buffalo mozzarella cheese comes from water buffalo milk instead of cows milk. We purchase ours from Costco and it is sold in plastic containers with briny liquid surrounding the small balls of the fresh mozzarella, or in slightly larger containers where the mozzarella pieces are tightly wrapped in cellophane. In case you cannot find fresh buffalo mozzarella in your grocery store, you can purchase it here. Prosciutto di Parma is the second ingredient for this baked chicken recipe. Prosciutto di Parma is the highest grade of this ham product and originates from Italy. There are other ham products labeled prosciutto but only those originating from a small area in Italy and meeting the highest of standards can be labeled as Prosciutto di Parma. From the special diets of the pigs to how the ham legs are processed and the long aging time all account for the superior taste. 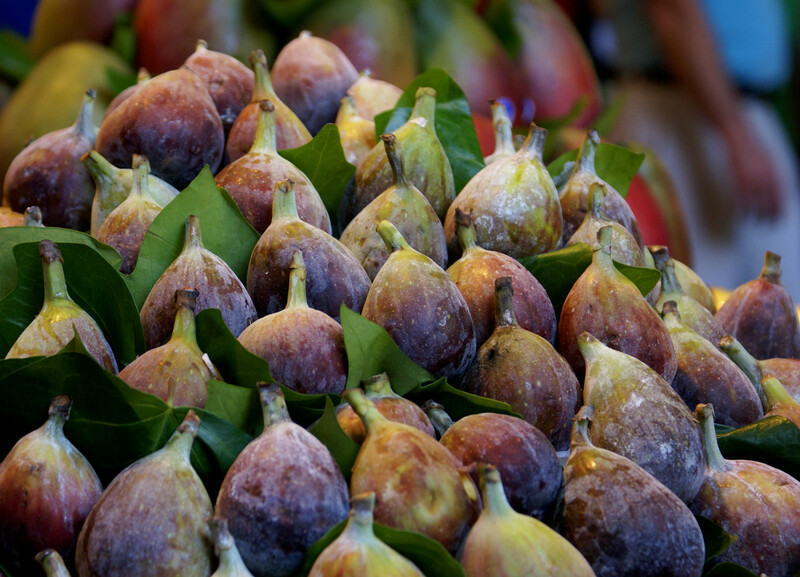 Most delicatessen departments in large grocery or specialty stores carry this prosciutto. Those of us with access to Costco stores such as we have in Houston, Texas are fortunate. 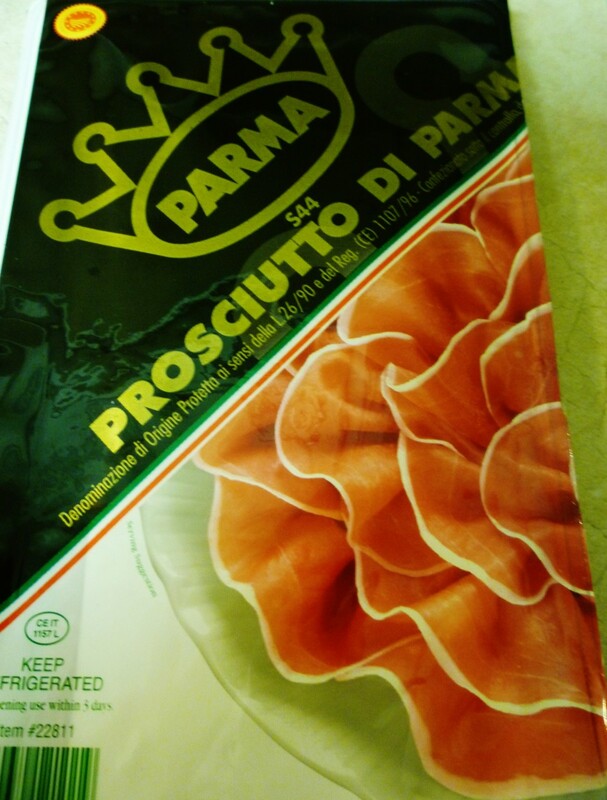 We can get the real Prosciutto di Parma packages direct from Italy at a good price. You don't need many slices for this chicken recipe so go ahead and splurge on this ingredient. You will be glad that you did! 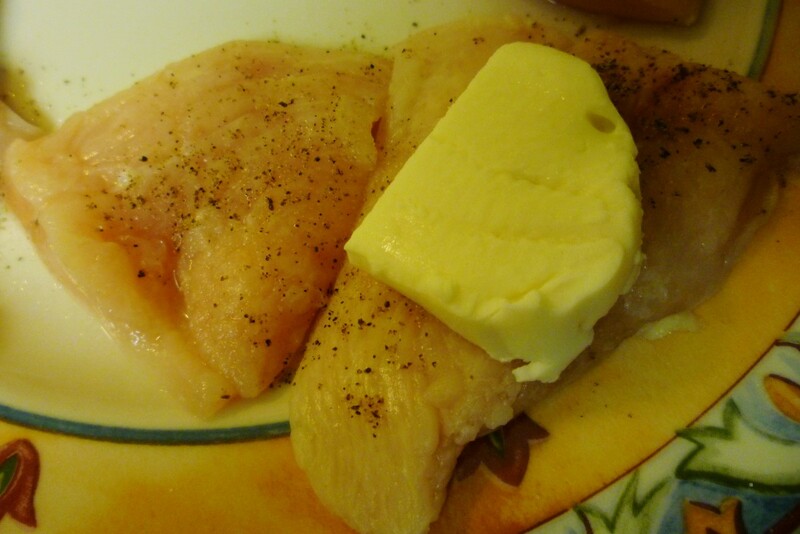 Our third and last prime ingredient is skinless boneless chicken breasts. The first step is to wash them under running water and dry them completely with paper towels. 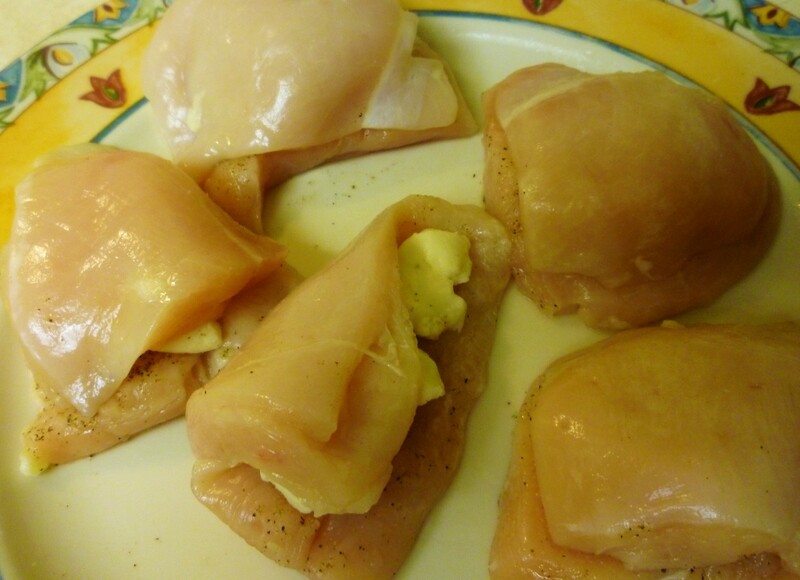 If they are large sized chicken breasts (as many of them are) cut in half into nice sized portions. Then slice with a sharp knife in half length-wise not cutting through entirely...as is shown in the accompanying photo. Lay them open and season them with salt and pepper to taste keeping in mind that the prosciutto is salty. 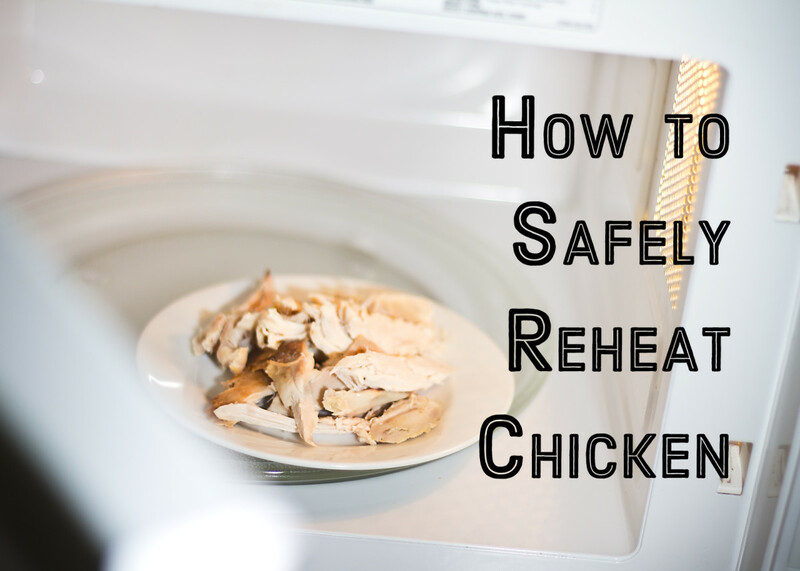 If using thin skinless boneless fillets of chicken you can skip this step. Just season one side of them with the salt and pepper. This is the appropriate name that my husband has come up with for this easy to assemble recipe since two of the three main ingredients come from Italy. The next assembly steps are so simple. Just cut slices of the fresh mozzarella cheese and put appropriately sized pieces onto the chicken folding the top back over it as these photos demonstrate. 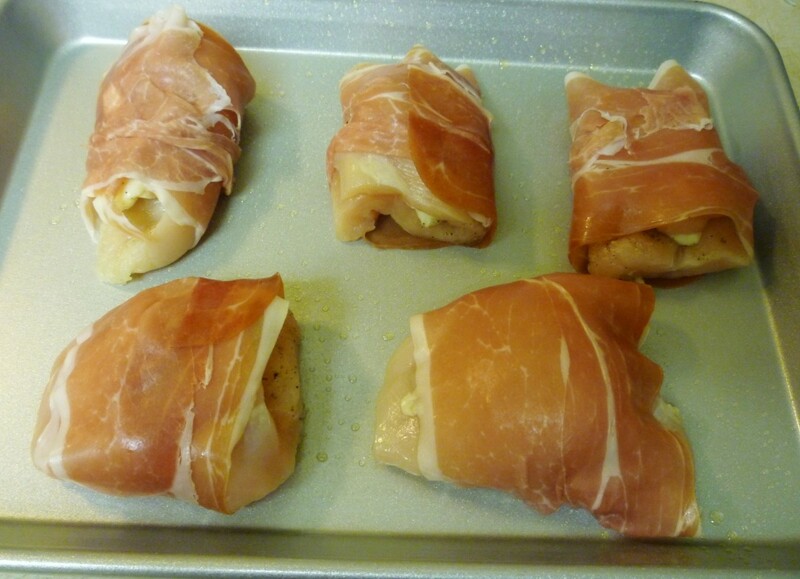 The next step is to simply roll the chicken and mozzarella in the paper thin slices of the prosciutto. One slice of prosciutto per chicken piece is more than sufficient. Place on baking sheets sprayed with Pam or lightly greased with some other product and place in a pre-heated 350 degree oven for 20 minutes or until it is done. 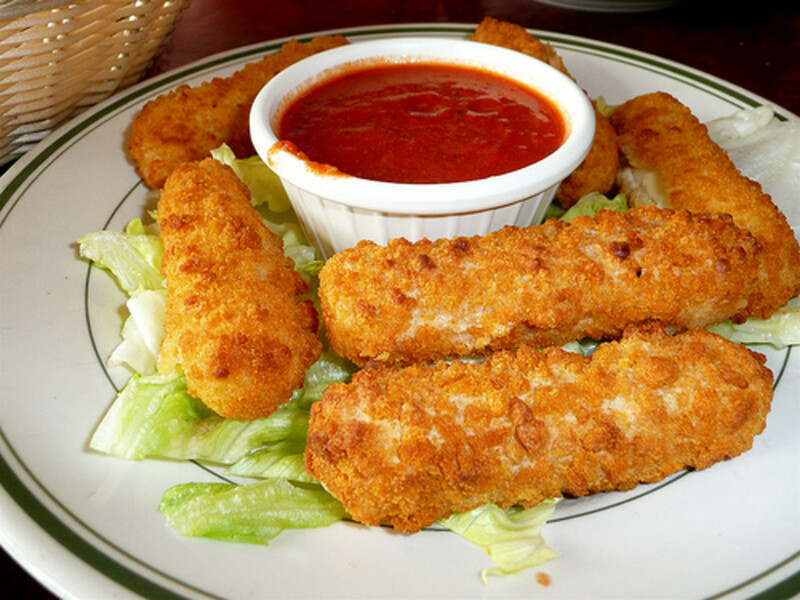 When serving to a plate be sure and use all of any mozzarella cheese that oozes out of the chicken. It is delicious! Chicken Mozzarella ala Parma ready to be baked in the oven. Be prepared for rave reviews from your family and friends when you make this simple 30 minute recipe using these simple but delicious ingredients. Serve with accompanying vegetables and perhaps a starch of your choice as well as a crisp fresh salad for a nutritious and wholesome meal. Risotto and baked asparagus would be a good suggestion. But I'll leave the rest of the meal up to you to complete. Hope you enjoy this chicken entrée recipe with definite Italian flair as much as we and our friends do! Buon appetito! Does this look like a simple enough recipe that you will be making for yourself and/or your guests? Absolutely...can't wait to try it! I am a vegetarian so won't be trying this. I do not ordinarily cook, but this looks fairly simple. So I just might give this a try. I would rather order something similar in a restaurant, but thanks for showing me the process of what goes into a dish like this. Please rate this recipe! Thanks! I am sure you would like this recipe. Everyone we have ever served it to has liked it. So sorry to hear that Jay is ill and that Heston Wayne is in the hospital. It would be wonderful if it was for his much-needed bone marrow transplant. Take care. Sending good thoughts your way! Ok so I have not eaten lunch yet and the hands on the clock are ticking closer to dinner time and I see this!!!!! O my I am drooling I am sure I have seen this before and I know I must make it thank you for sharing Angels are on the way this afternoon I am with my Jay who is very sick this weekend It seems we cannot keep them all well at one time Hess was in hospital this week. The recipe could certainly be amended to suit your taste. Hope you enjoy it. If it wasn't for the proscuito.... I'd probably have already made it.. I love the idea of combining chicken with cheese! Maybe I'll just add a pepper or tomato slice on top if I do make it. Oh, wow...my mouth is watering! I'm def going to try this. The taste combo sounds amazing! 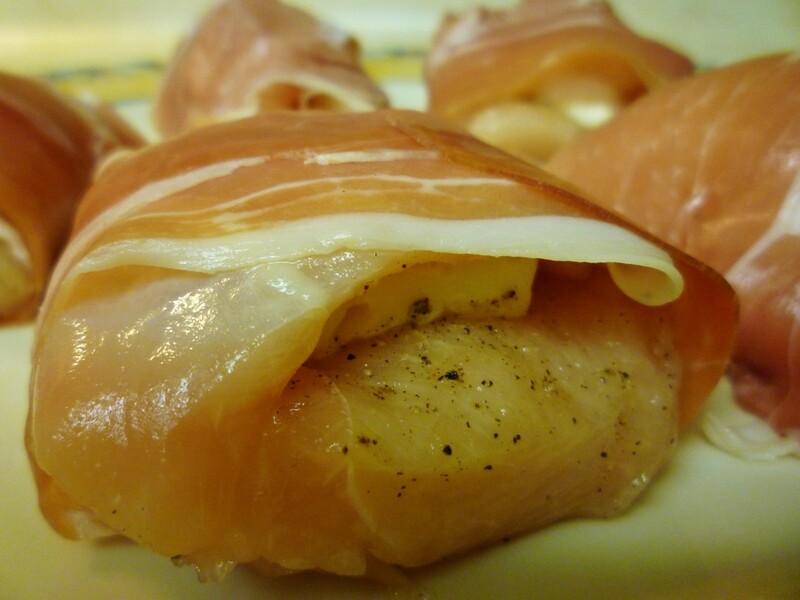 Since you love eating prosciutto you should truly like eating this easy and delicious chicken recipe. Enjoy! Yum! I should not have read this while I was hungry. Thanks for this great idea for a quick and delicious meal. I love prosciutto. This truly is delicious. I hope you get to try it sometime. If you have a deli near you, you can have them thinly slice a piece of prosciutto and give you a taste. You want it to be sliced paper thin if possible. A substitute if you cannot find prosciutto and do not wish to order it online would be very thinly sliced ham. Again...get it as thinly sliced as possible to replicate the prosciutto. Does that ever look good...delicious I bet! I don't think I have ever had Prosciutto, but I do want to try it. Wrapped around chicken with mozzarella sound like a real treat. Not only does this chicken mozzarella dish look great...it tastes even better! :)) Thanks for your comment. This truly would be a good restaurant dish but is so simple to make at home. Hope you give it a try! Amazing looking dish. Great job! Hi Peggy I know my family will ask me when I will make this for them a second time. I rarely cook such dishes for my self but when I want to try a fabulous recipe such as this, I provide dinner that night for my family. There is no doubt this will be a hit...all of the foods involved are favorites. I think that you will really like this recipe when you give it a try. It makes a great company dish! 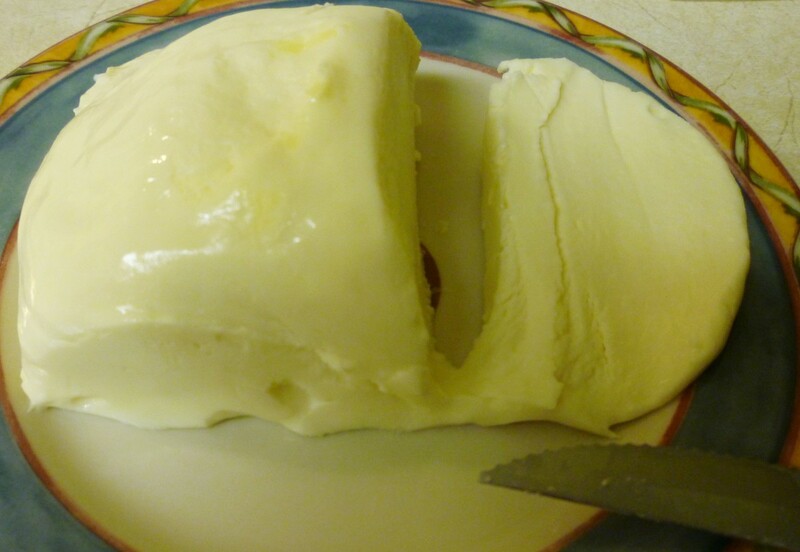 I have to admit I have never used Mozzarella like this. You taught me something new with this recipe. I've never used Prosciutto either! I will certainly try this recipe. BTW: I can see why this Hub got HOTD. The prosciutto is almost paper thin and of course has a different flavor. If you cannot obtain prosciutto, then I guess bacon would be the next best substitute. Just be prepared to drain it as it will put off a lot of bacon fat grease as it is baked. Not sure of the timing whether it would cook at the same time as the chicken. Guess you will have to experiment. Let me know if it works out, OK? Thanks for your comment and votes. That looks delicious and easy to do! I have to admit, I would probably use bacon instead of prosciutto, though! :) Voted up and useful! I think that once you make it, you will be making it many more times. This recipe is simple and so very delicious. Thanks for your comment. Wow, does this look delicious and easy to make. Putting the ingredients on my shopping list so I can try this! I know that many people do quite a bit of cooking in their microwave ovens. I am sure that it could be accomplished using this recipe. Obviously it would not take as long a time. You would just have to experiment regarding the timing. All that truly needs cooking is the chicken. If you try it, please come back and tell us how long it took in the microwave so that others know. Thanks! Sharing this one. I don't have a baking oven, peggy. Can I do this with my microwave oven? If you like those other chicken dishes...am sure you will like this one. Coupled with the fact of it being so easy to prepare and cook...it is a winner! Thanks for your comment. This looks so good. Love chicken Kiev and Cordon Bleu, so this is definitely something I will try. So glad that you found this 30 minute recipe to your liking. Thanks for your vote and comment. looks delicious ,very easy to cook recipe ....thanks for sharing..
OK, not pinned, as seems you blocked that ... but, the thought was there lol. Incredibly simple, but also incredibly delicious going by your photos. I'm definitely sharing this with my followers, as I'm sure some of them will want to try. Also pinned, tweeted and voted awesome. Am sure you will like the flavors since you like the ingredients...and even better is the quick and easy preparation. It also makes a great company meal. Thanks for your comment. Oh, this looks absolutely delicious! I definitely have to try this one, since prosciutto and mozzarella are two of my favorite things! I love this delicious recipe! Appreciate your congrats on this hub getting a Hub of the Day award. Am sure that this recipe would be good without the prosciutto also since you do not eat much in the way of pork products. Thanks for your comment, votes and the share. "Mouth watering" is a good way to describe this Italian inspired chicken dish with the buffalo mozzarella cheese and the prosciutto. Thanks for your comment. A yummy recipe! I am a big fan of Italian dishes. I like the idea of combination of chicken and cheese. In my country, pig meat is not commonly eaten. I will try this recipe with some substitute for prosciutto. The first photo look so delicious and beautifully captured! CONGRATS on the hub of the day! Well-done! This is mouth watering stuff! Like your enthusiastic response to this mouth watering recipe! Am sure it will become a favorite in your home after you give it a try. It was my pleasure to share it with you and others. Thanks for your comment. Glad to hear that you liked the look of this chicken recipe. If you like the 3 simple ingredients, hope you get to taste it someday. Thanks for your comment. Nice seeing you here! BTW...you don't have to be any kind of an accomplished chef to make this simple 30 minute recipe. And if you like chicken and cheese + prosciutto...you will LOVE this dish! Thanks for your comment. Glad to hear that the photo of this cheesy chicken recipe with prosciutto caught your eye. Am certain that you will enjoy it when you make it. Appreciate your comment. Appreciate the congrats on getting a Hub of the Day award but even more for your taking the time to take a look at this easy recipe and leaving a comment. Thanks! Nice to know that you will be trying this simple and mouth watering chicken recipe soon. I would wish you luck, but you don't even need it. Thanks for your comment. I appreciate the HOTD congratulations, but still playing catch up with my comments because of it. Nice to know that you liked it. It is a really easy recipe! Thanks! So glad that you found this 30 minute recipe of interest. It IS yummy! To that we can attest! Thanks for your comment. This looks so good I can't wait to try it. Thanks for sharing. Am sure you could play around with these 3 main ingredients and come up with good alternative recipes as well. These are good ones! Thanks for your comment. You are right in that this would probably also make a delicious sandwich. Good idea! Thanks for the congrats on the Hub of the Day award and I am appreciative of your comment. This chicken recipe is mouth watering indeed. Enjoy! Thanks for your comment. So glad to hear that you liked the photos, videos and information as well as the recipe in this hub. Thanks for the congrats on HOTD and for your comment. You shouldn't have much of a problem finding some prosciutto for this recipe. If you buy it from a deli, have them slice it paper thin. Thanks for your comment. Nice to hear that you will soon be trying this recipe. Enjoy! and thanks for your comment. As you say...not bad for 30 minutes of effort! :) Thanks for your comment. In addition to the great flavors, that is what is so nice about this recipe...the small amount of time it takes to make it. Thanks for your comment. Thanks for the congrats on receiving a HOTD. Hope you enjoy this easy recipe for yourself sometime soon. Congratulations, Peggy! This will be served for my family's dinner next week. I'll see to it that I will have all the ingredients. It is great for a Chicken-Prosciuto toasted sandwich too! I love prosciutto cotto! So glad that you liked this recipe. Thanks for your comment. Enjoy! The food looks delicious, thanks for sharing with us, voted awesome. Congrats on HOTD. This dish really does look good. I'm printing it out to save. This new format doesn't give too many choices for voting on recipes, does it?? I needed a new way to cook chicken. Thanks so much. Goodnight. The ingredients for this dish are really simple and so flavorful. Thanks for your comment. Wow - This recipe looks delightful! I love cheesy foods and the photo caught my attention right away. Must try this myself soon. Thank you for sharing it. Great hub and congrats on bagging the HOD award. The recipe reads so yummy... I am sure it will be super delicious. 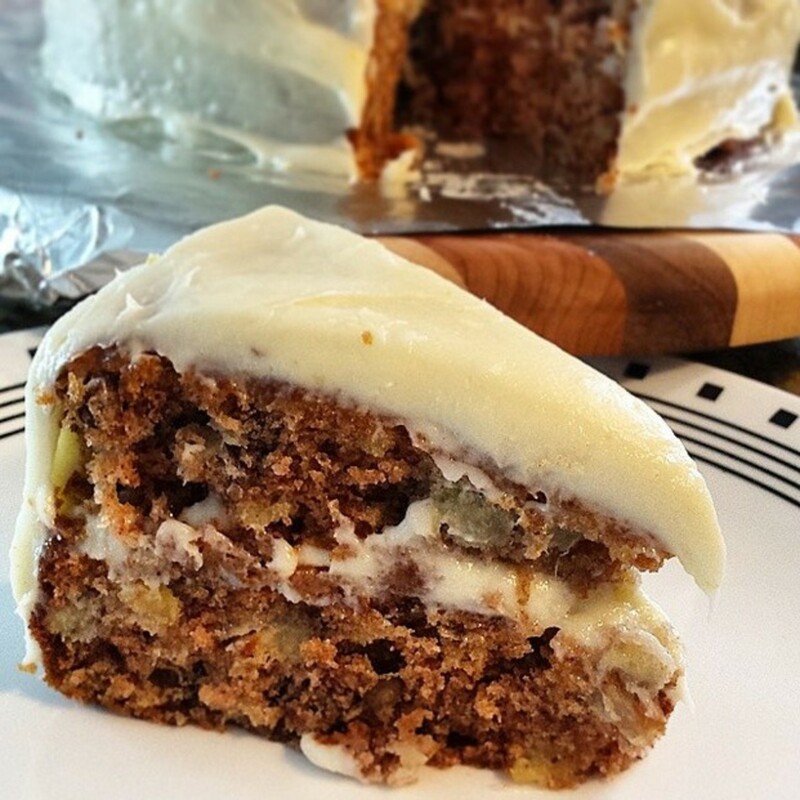 Glad to see this simple, delicious recipe made Hub of the Day! Wow..I looks like totally yummy! Thanks for sharing. LOve it! Definitely wonderful. With just three ingredients you can create such a delicious dish. Of course nothing beats using the suggested ingredients, but I think I can explore alternatives here. Hi Peggy! Firstly, CONGRATULATIONS to you on this winning hub! Secondly, I just love what you did with the chicken breast. 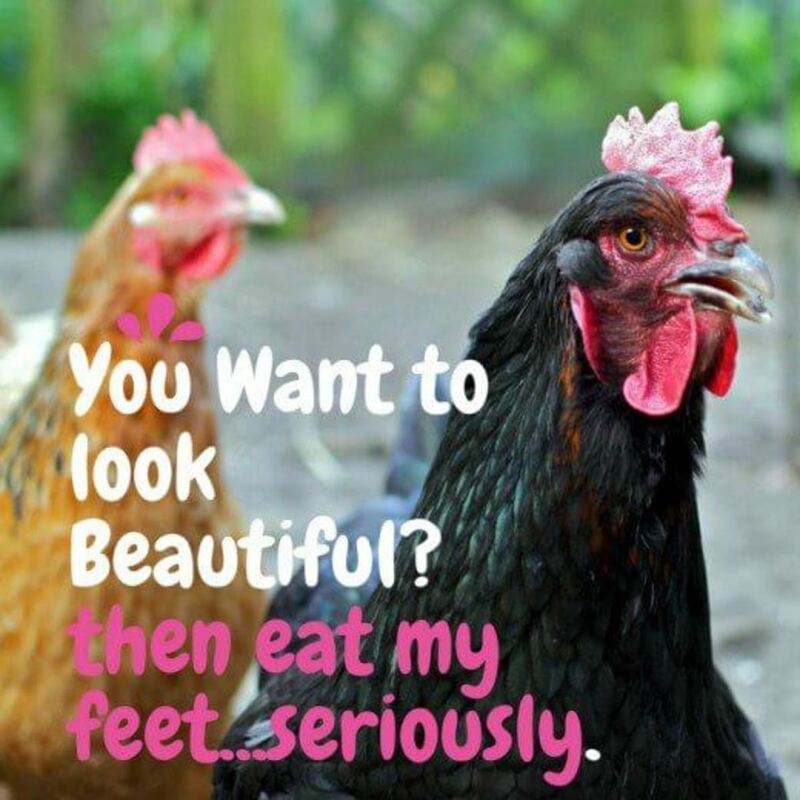 I am not that a chicken fanatic, but my loved ones are. I am very eager to make this for them and a taste for me too. I love prosciutto! This chicken with prosciutto de parma and mozzarella will be great for a toasted sandwich as well! Voted up and it's definitely making me hungry! Looks detailed and fabulously tempting! This looks really good. And I love that you combined some of my favorite things to eat. Congratulations on Hub of the Day. There is a good combination of facts, video, and supplemental information. Wow....it looks great! And you got a lot of great comments. I will look for the place I can purchase Prosciutto just for this recipe. Thank you. Congrats for the hub of the day! It looks tasty. I love all the 3 ingredients and I can´t wait to try this. Thanks for sharing. This looks amazing. For 30 minutes of effort, it's well worth every minute spent. Congrats on HOTD. As you mentioned, this is a great company dish and what makes it even better is that it is so easy to prepare! Appreciate your comment and mention of this HOTD award. Thanks! So Yummy. Thanks for sharing it.Voted up. It tastes even more amazing than it looks. Thanks for checking out this hub and leaving a comment. wow, this is fantastic. I can't believe it takes under 30 minutes! Voting across the board and pinning. This looks super easy & super delicious. Congrats on HOTD, Peggy W! Awesome hub. I would think that substituting turkey ham would work. Let me know as others may also be interested in your cooking results. Thanks! We were just at Costco yesterday purchasing more prosciutto among other things. Hope you enjoy your dinner entree tonight. Thanks for letting me know...and enjoy! This is a slick and easy recipe. I would give this a try soon. The chicken smothered in chesse and held together with prosciutto MMMM. I bet it has a smoky flavour too. Congratulations on winning HOTD! Appreciate your comment and the congrats on getting HOTD. Hope you give this 30 minute recipe a try someday. Peggy, Peggy, PEGGY!!! Oh my, this looks tantalizing tasty!! I was on my out to Costco, and now I know what I will be making for dinner tonight!! Thank you and your husband for a delicious dinner entree! Congratulations on you HTD award and feature! Share this recipe with whomever you wish. You might want to give it a try yourself. Thanks for your comment. If you like oozey cheese recipes, then this one is for you! Thanks for your comment. Always nice seeing you here leaving a comment on my hubs. Appreciate the congratulations on receiving a HOTD award. Thanks! If you cannot find prosciutto, the next best thing would be to get some good flavored thinly sliced (paper thin) ham at your local deli. It will be different from the prosciutto, obviously, but still should be good flavored and lend flavors to this chicken entree. Thanks for your comment and the congrats on getting HOTD. Oh my goodness! This looks so yummy! I can't wait to make it. Congrats on the HOTD. This hub is definitely deserving of that title. Voted up, shared. This looks amazing and so easy! You will definitely wow dinner guests with this recipe. Thanks for sharing this! Congrats on getting Hub of the Day. Hi Peggy, and what a great hub this is. I think I'll try this recipe next Sunday - looks yummy! Yes...isn't it nice to have an ingredient list with only 3 things on it, plus salt and pepper! Thanks for your comment. Dinner time is negotiable. Just let us know when you will be in town. 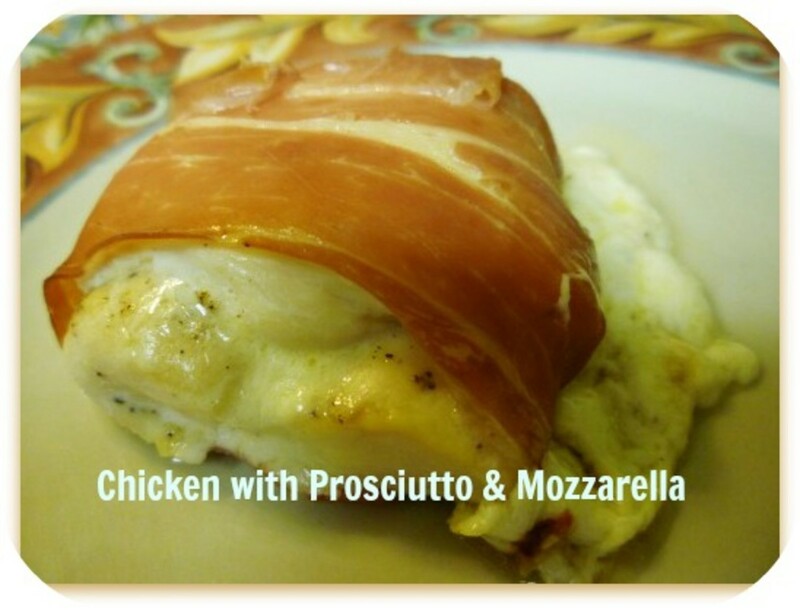 :) Thanks for your comment on this easy chicken recipe using prosciutto and fresh mozzarella cheese. The ease and quickness of making this recipe is what is so nice in addition to the great flavor, of course. Appreciate your comment and the congratulations on receiving a HOTD award. Thanks! Be sure and grab a napkin to dab your lips for this mouth-watering chicken recipe. No drewling allowed! Haha! Thanks for your comment and particularly the sharing.